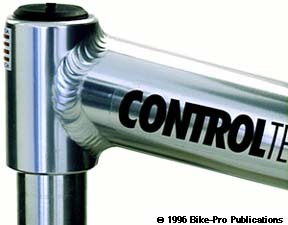 After the success of the Control Tech's Control Stix handlebar extensions, their next monster success has been the Control Stem. Control Tech continues to succeed because of their simple, elegant, functional designs, that are unerringly executed to the highest precision. The quill is made of two pieces, a Silver quill that is fastened rigidly into a Black body tubing section, which is welded to the extension itself. The quill piece is made of a single piece of machined aluminum that is turned on a lathe to reduce the outer dimension precisely to fit the steerer tube. This solid piece is then conically bored from the top to a depth of 2 1/4". The conical hole reduces from a 7/8" ID at the top to a 9/16" where the expander bolt head rests on a 6mm thick "floor" that is also the ceiling of the lower tubes bored out cavity. The piece is then bored with a similar conical hole from the bottom. These holes from both directions leave the integrity of this single piece intact, while removing a few cubic inches of aluminum, and it's weight. More importantly it reduces the length of the steel expander bolt considerably, so there is a significant weight reduction, by having less steel rod. This quill piece has a thinly tapered side, that is pressed in and bonded to the outer Black body tube, after the stem has been painted. The Black body piece is made from 3mm thick aluminum tubing. The extension tube is made from round, non-ovalized aluminum tubing. The binder tube is done a little differently. It's made from an aluminum extrusion, that includes what would be a full width binder fitting surface. The aluminum extrusion is turned on a lathe to carefully trim the excess lineal binder material and sculpt the binder fitting area to it's elegant shape. Both the front and rear of the binder system are drilled for the bolt and to create a recess for the bolt head and nut. The binder nut is a stainless steel, pressed in, nutsert, so the bolt won't strip what would otherwise be threaded aluminum. The binder assembly is drilled with a 1/2" hole that faces into the extension tube to relieve heat and stress build up as the quill, extension and binder are TIG welded together. After welding the binder is sawn through to create the cinch system. All of the welds are broad and cleanly pulsed. At this point the stem is re-tempered, (heat treated) to bring the welded portion back to the original T6 hardness. Prior to painting, the open holes on the stem are plugged, then it is electrostatically painted with a high gloss Black powder paint. The expander bolt, made of cadmium plated steel, is 70mm long, with 8mm threads by a 1.25mm thread pitch. The expander bolt has a 6mm allen head and weighs only 31 grams. The binder bolt is made of nickel plated steel, has a 5mm allen head, with 6mm by 1mm thread pitch, and is 15mm long weighing 5 grams. The expander wedge is made from machined aluminum rod, which has been turned to the precise diameter, cut, drilled, and tapped. The opening in the top of the quill is closed by a press in, Black, rubber plug, so it won't become a receptacle for dirt. 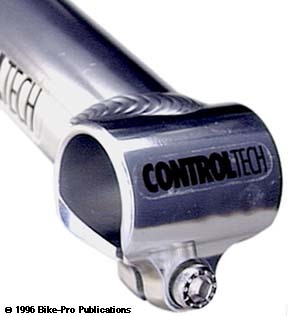 The Control Stem is made in a 0 degree rise, a 10 degree rise, or a 25 degree rise in 1", 1 1/8" or 1 1/4" diameters. All three rises and all diameters come in 120mm, 135mm, and 150mm lengths and fit 25.4mm diameter mountain handlebars or 22.2mm handlebars with a shim. You will have to use a Ritchey Cliff/Clamp-on Hanger, Syncros Hang Doggy, or the DiaCompe equivalent listed separately in the Brake section of this catalog. The weight of a 150mm long, 1 1/8" diameter Control Stem with a 10 degree rise and plug is 286 grams. The weight of a 135mm long, 1" diameter Control Stem with 10 degree rise and plug is 255 grams. Black only, specify diameter and length when ordering. After a the sucess of the ATB stem Control made a few small changes and released their Road version of the stem. The quill and the extension tube are the same. 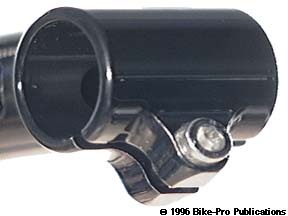 The binder tube naturally has a slightly larger inner diameter, and is 26.0mm to fit the majority of Road handlebar center diameters. Control also cut away, slightly, the right and left side of the bottom of the binder tube, for easier installation of the road bars. 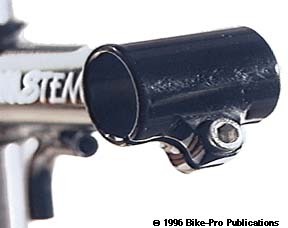 The Road Control stem is Silver in color so it's distinguishable at sight. The Control Road is available in the 1" diameter only, in 90mm, 100mm, 110mm, 120mm, 130mm, or 140mm. The Road is available in either a 0 degree rise or a minus 15 degree rise. 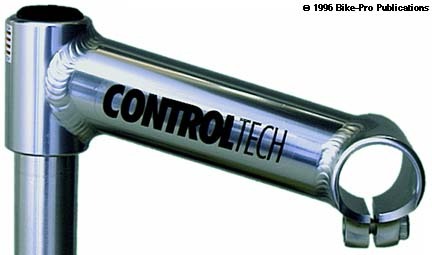 A Road Control stem 120mm long wieghs 234 grams. Control Tech is one of the stem manufacturers that has been licensed by Dia-Compe to make stems for Dia-Compe's "Ahead Set" project. The Control Tech Ahead ATB Stem uses exactly the same extension, and binder tube, with the same brake cable routing, and the same binder bolts as the Control ATB Stem. 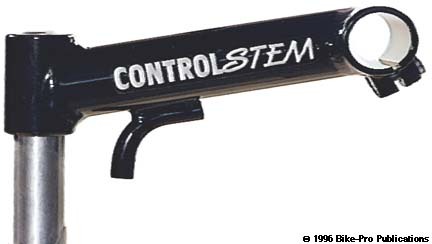 The stem body on the Control Ahead ATB Stem is made of the same extrusion as the binder tube. The extrusion is turned on a lathe, in this case to make two binder fittings, with the piece TIG welded to the extension vertically. There is a stainless steel nut pressed in place for each of the vertical binder bolts. The TIG welds are the same high quality that Control Tech has always been known for. 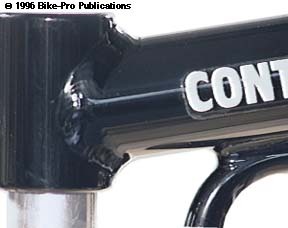 The Control Ahead ATB stem is powder painted in a high gloss Black. It is available to fit 1", 1 1/8" or 1 1/4" steerer tubes and comes 120mm, 135mm, or 150mm extension lengths. 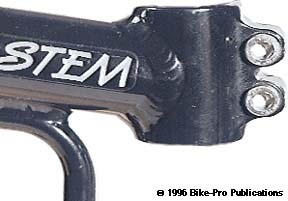 This stem is made in a 0 degree or 10 degree rise. A 120mm Control Ahead stem to fit a 1" steerer weighs 175 grams. Small changes in the ATB Ahead stem yield a perfect Road stem. Like the quilled version of the Road stem, the Ahead version is made in Silver only, and only to fit a 1" diameter steerer. The lower half of the binder has trimmed away sides, and has the larger 26.0mm inner diameter needed for Road handlebars. The Ahead version of the Control Road comes in the same Road lengths, 90mm, 100mm, 110mm, 120mm, 130mm, or 140mm in either a 0 degree or a minus 15 degree rise. A 120mm Control Ahead Road with 0 degree in a 120mm length weighs 174 grams.